The Skylight is part netbook, part smartphone, and I'm pretty sure I could throw it 50 yards. The real question is if that makes it a game-changer or a novelty act. The look and feel are certainly novel, if not novelty. The Skylight has an ultrathin clamshell design and weighs less than two pounds—it feels like a frisbee in your hand. It's a sturdy build, though, and seems like it could handle being jostled around in your bag. When you open the Skylight, you're greeted by a screen of six "web gadgets" (apps, basically), that give you immediate access to services like photos, Firefox, YouTube, Gmail, etc. You can scroll through these, but there's also a row of minimized web gadget icons at the bottom of the screen for easy, instant navigation. Once you select the app you want to work in, it maximizes to two-thirds of the screen, keeping two other gadgets open to its right. The 10.1-inch hi-def display is more crisp and clear than most netbooks, and 720p video looks great. Unfortunately, the model we saw was running off of 3G, which made the playback hiccupy and the file slow to load. The Skylight also comes equipped with a full island-style keyboard, which is a relief. Typing was smooth, and the trackpad was plenty big. Although it's not multitouch, it does support two-finger scrolling. The Skylight has its own 8GB memory kernel to keep things running, and a 4GB USB stick (upgradeable up to 16GB) on which you can store your content. The way they've integrated the stick is clever and unassuming; it sits flat above the keyboad, and can be easily lifted up and removed from the rest of the unit. There's not much in the way of ports, but the Skylight does have HDMI-out, which is great if you plan on storing movies on it. The Snapdragon processor is said to get 8 hours of battery life, but even if it's half of that with HD playback (which is often the differential between listed battery life and actual), that's more than enough to watch a movie or two on a long flight. So what's the hitch? 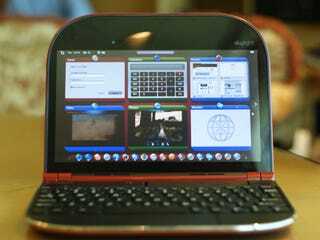 Well, at the moment there are only a limited number of Skylight apps available to you, and most of those don't gain anything by being on your smartbook instead of a smartphone or netbook. Lenovo's going to open up the SDK soon, but until developers get a crack at maximizing the Skylight's functionality, it won't have much. It'll have built-in Wi-Fi, but it also will rely on AT&T's 3G network, which even in our demonstration wasn't up to the challenge of streaming the type of hi-def video you're going to want to. There's potential here, but it might be some time before the Skylight is ready to shine.